This home at 17 Garland St. is among several the city of Bangor is seizing for delinquent taxes. The former Rice Glass building on Hammond Street has been seized by the city of Bangor for nonpayment of taxes. 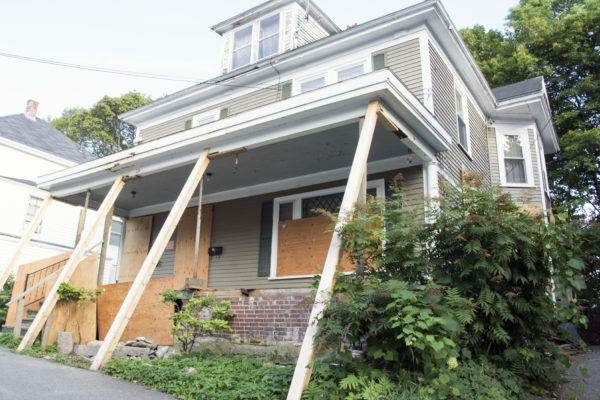 The Bangor City Council on Monday night authorized the city manager to formally take possession of nine tax-delinquent properties for which tax liens have matured without anyone stepping up to reclaim them. 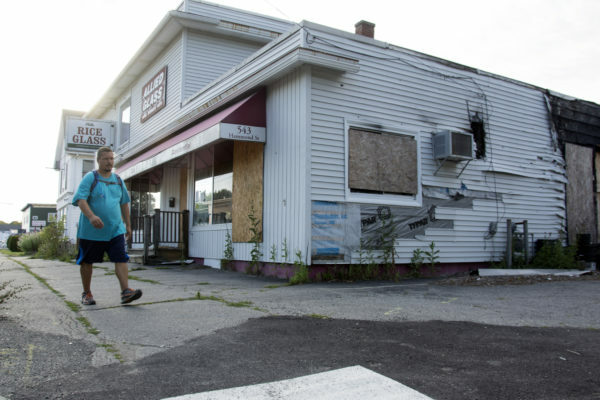 The properties include three vacant parcels, a commercial building damaged by fire and six buildings that have been placarded as unfit or unsafe — four of which are targeted for demolition. The nine properties city councilors voted to take over represent the largest number the city has acquired for unpaid taxes at any given time in recent history, if not ever, Finance Director Debbie Cyr said. The properties eventually will be put out to competitive bid, in some cases with a minimum set so the the city can recoup what it can of its losses, Cyr said. Taking people’s properties is a last resort because it’s not the city’s goal to make people homeless, Cyr said. “But we can’t help you if you won’t call us,” she said. — 17 Garland St., formerly owned by Gary A Watson, $38,414 owed in taxes and stormwater and sewer fees. The building is placarded by code enforcement and previously was an illegal rooming house. — 39 Nelson St., formerly owned by George Kiriakopoulos, $7,856 owed in taxes and stormwater and sewer fees. The building is in poor condition and has been placarded with a demolition order. — 472 Essex St. previously owned by Richard and Jennifer Moore, $15,497 owed in taxes and stormwater and sewer fees. The building is in very poor condition and placarded with a demolition order. — 543 Hammond St. formerly owned by Edward P. Rice of Rice Glass, $22,007 owed in taxes and stormwater and sewer fees. The building was damaged by fire. It has been placarded with a demolition order. — 45 Fremont St. previously owned by Robert and Alberta Winkle, $7,575 taxes and stormwater and sewer fees. The building is a very poor condition and has been placarded. — 450 Ohio St., formerly owned by Betty Lynne Goodwin, $10,508 owed in taxes and stormwater and sewer fees. The building is in fair condition but has foundation problems. — Vacant land at corner of Broadway and North Bangor Road, previously owned by Woods of Maine Inc.
— Vacant land on Essex Street formerly owned by the Whispering Meadow Lot Owners Association. — Vacant land on Essex Street previously owned by Woods of Maine Inc.
Councilor Ben Sprague said during the meeting that he saw the decision to acquire the properties as a fairness issue. “It’s not fair to the surrounding property owners. It’s not fair to all the property taxpayers who do pay their taxes on time and in full and I think that this is a logical conclusion of a long process,” he said. “If people don’t pay their property taxes, it basically means the rest of the property taxpayers subsidize that person’s use of city services, which is not fair,” he said. In an Aug. 7 memo to the council’s Finance Committee, several department heads and other staff members noted that they had identified 131 real estate accounts that had at least one matured tax lien. That list, however, was pared down to 12 — nine of which were tackled on Monday — after mobile homes, owner-occupied properties and properties on which partial payments have been made were removed and after 15 of the delinquent accounts were paid off through agreements with the city. The remaining three will be handled later. Monday night’s takings are the latest in the city’s ongoing effort to collect taxes owed to it. Councilors made clearing the city property tax rolls of delinquent accounts a priority in 2013, when they directed staff to begin the process of acquiring two properties whose owners were more than five years behind on taxes. The crackdown on tax-delinquent properties became tougher last year, when the city issued written warnings to those owing back taxes, stating it would take over their properties if they didn’t respond and try to set up payment plans. Those letters brought many people forward, city officials said at the time.